Two thirds of people would be willing to see charges similar to the 5p plastic bag levy applied to other single-use plastics such as bottles, cups and straws, a survey suggests. Almost nine out of 10 (87%) were concerned by the UK’s use of plastics, a poll of more than 2,000 people for Sky Ocean Rescue by FlyResearch found. 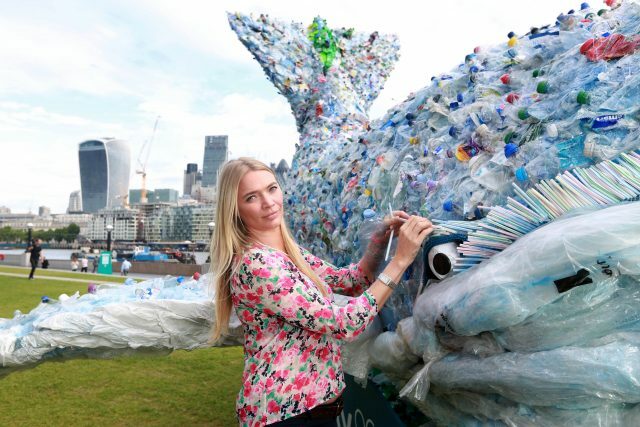 The results of the survey were revealed as a giant whale model made of the same amount of plastic bags, bottles and other litter which pollute the oceans every second was unveiled to highlight the scale of the problem. Explorer Sir Ranulph Fiennes and model Jodie Kidd helped reveal the 10 metre (33ft) creation in London. It is made of plastics from oceans, beach cleans and local recycling plants, and will go on a tour of England, Wales and Scotland. The tour will give members of the public easy tips on how to tackle the plastic waste problem, from using a refillable plastic bottle to saying no to straws and plastic bags. Researchers have estimated that eight million tonnes of plastic pollution enters the ocean globally every year. Sir Ranulph said: “I’ve explored some of the most remote and vast points of the world and yet still witnessed the reach of ocean pollution. Kidd said: “There is nothing I enjoy more than being on or by the water – sailing, rowing, on holiday – and it terrifies me that our beautiful oceans are being destroyed. The Sky Ocean Rescue campaign, which will see the whale tour cities and coastal spots including Cardiff, Blackpool Promenade and Edinburgh’s Ocean Terminal, is being supported by the Marine Conservation Society. A small charge on packaging items and deposit return schemes could help tackle the problem, she said.